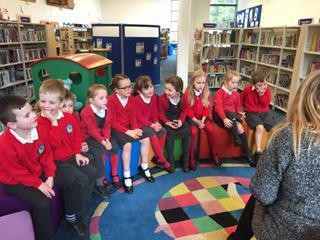 Eleven Year 1 children from Green Class have been visiting Ashbourne Library on Friday mornings, for a story session and to borrow books. This is a fantastic opportunity to introduce children to the wonderful world of books, and to encourage their love of reading. The staff at the Library make the story-telling sessions great fun, and the children love to choose their own books, which they can take home for a week. Thank you very much to the Library staff!